With EncircleALL™, you can expect more calls, more coin in the cash box, more operator services commission, more dial around compensation and more profit than you ever thought possible. EncircleALL™ delivers comprehensive, market driven, profit boosting services, including International coin calling, and 1.866.866.CALL™, the lowest discount operator service rate in the business. Period! You’ll receive constant marketing statistics and data that empowers your business. Helping ensure that your future decisions are the right decisions, based on confirmed facts, statistics and actual trends. With EncircleALL™, you’ll get instantly recognizable, professionally designed payphone advertising that draws people to your phones like bears to honey. Whether they’re calling across the street or across the globe, your customers will learn that they can make calls from your payphones with complete confidence and peace of mind… with or without coins. And they’ll be back. EncircleALL Grabs Attention and Gets Results! Talk Too Me invested heavily in the development of the technologies, services and advertising signage for EncircleALL™. Our expert team carefully constructed the advertising to have maximum appeal to the broadest audience. The advertising reaches out, grabs the caller and causes them to make calls that enhance your profit—immediately. We left no stone unturned in the design, copyright and trademark process. For example, to assist callers that cannot read or speak English, we incorporated full instructions in Spanish, the most commonly spoken language, after English in the U.S.A. This remarkably simple but elegant solution dissolves language barriers increases calls and the revenues you receive. Easy, Simple and Ready to Go! TTM’s EncircleALL™ program is easy to implement and is fully compatible with all pay telephone and hotel equipment. Programming is simple and you can access your current and historical revenue and call detail information from any computer anywhere in the world at any time, 24/7/365. Updated daily, TTM’s online reporting makes it easy for you to stay informed. EncircleALL™ is combined with our operator center, one of the oldest in the U.S.A., proudly celebrating a rich tradition of excellence spanning more than one hundred and eight years. TTM operators enjoy excellent working conditions, compensation and incentives. We develop fulfilled, loyal, long term employees that deliver expert service day after day, year after year. Working with us, you are working with a CENTURY of knowledge and know-how that you can well imagine proves we have been the first to provide every Operator Services option in the industry! We are rated Number 1 in the U.S.A. and voted the BEST of the BEST! Free upfront EncircleALL™ advertising on every payphone — when you see it you’ll want it — ASAP!*. Ready to Go — Implementation within 10 days! The EncircleALL Revenue Card immediately captures the attention of the caller and directs them toward the best method for completing their call! The positive consequences of the customers experience are excellent and the lasting experience to you (the PSP’s) is cumulative! Of course, of great importance is your profit, which based on excellent customer experiences both expand and grow! Key instructions are provided in both English and Spanish so you can maximize your profit by connecting with the Public, including the 40 million Hispanic people that live in the USA. You’ve got it, so ADVERTISE IT! Assure and reassure the caller that each and every time using your payphones they can enjoy the lowest rates, whether calling across the street or around the globe. With EncircleALL, TTM makes it easy for you to offer value and increase your call volume, revenue and profits. Increase coin in the cash box by making it easy for people to make coin calls at your payphones. Promoting both USA, Canadian and International calling and providing customer oriented, easy to follow instructions, you can expect more calls, more coins and more profit than you ever thought possible. Spanish—The language of 40 million U.S. residents. By providing extensive directions in Spanish as well as English. EncircleALL makes it easy for everyone to use your phone and ensures that your payphones appeal to the broadest possible audience. It’s easy to add incremental revenue when you add Canadian, Caribbean and International coin calling with EncircleALL. Now your callers can call around the globe for just $1.00. Say “Goodbye” to prepaid cards and “Hello” to new found coins in your cashbox! The HANDSET and GLOBE equal World-wide Recognition! EncircleALL visual prompting, “Pick it up and make a call! “ Clearly displayed on all Encircle advertising signage...sending the message again and again! A picture speaks a thousand words. This simple, full color graphic clearly tells the caller that their credit cards and calling cards are welcomed at your payphone and encourage the caller to dial 0+ to use them, resulting in even more commission for you. Maximize OSP profit by converting the maximum number of dial around calls to commissionable OSP calls. By first promoting the 0+ dialing method, more calls are converted and delivered to us, driving your OSP commissions to higher levels! Increase commissionable OSP calls by attracting callers that ordinarily use AT&T or others and prompting them to call using “0+ / 00” rather than 1.800.CALLATT, etc. You’ll get paid for the call in your next OSP commission check rather than waiting months for dial around compensation. You’ve got little more than a few seconds to capture the attention of the casual caller who may be confused or about to place a dial around call. EncircleALL signage grabs their attention and directs them to dial using 0+ resulting in higher commissions for you, paid with your monthly OSP commission check. Advertise like a Madison Avenue expert! With TTM, you partner with a company that invests heavily in market research, advertising design, data analysis and customer support. You don’t need deep pockets to advertise like the pros, you just need to partner with them. 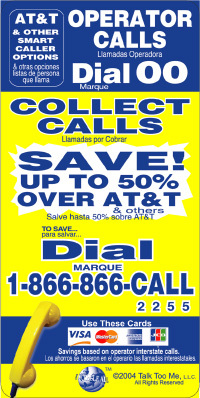 Simply place our advertising on your payphones and watch your calls increase. Instantly recognizable signage results in payphone users feeling at ease and comfortable using your payphones. Across the country, the public associate EncircleALL with high quality services at great value. Speak the languages of the world with the only program that offers directions in English, Spanish, German, Dutch and Japanese. By making it easy for foreigners to place international calls, EncircleALL makes it easy for you to increase your revenues and profit. No coins? No problem! Credit cards have become the most utilized method of payment, worldwide. With TTM, the callers payment options are clear, concise and designed to increase your commissions! Add commissions by enabling operator assisted international calling. Who are the most meaningful people in anyone’s life? Mom and dad—right? If you’re going to remind someone to call someone else, who better than Mom and Dad? Increase coin revenue by enabling International coin calls from your payphones. With TTM, you can compete head-to-head with prepaid calling cards and win both value and customer loyalty. Your callers can call virtually anywhere in the world for up to 10 minutes for just one dollar! More calls = more money! More profit is generated by first prompting the caller to dial using “00” for operator calls. Higher rates = higher commissions and less OSP revenue erosion than with other discount operator products. Instantly recognizable signage results in payphone users feeling at ease and comfortable using your payphones. Across the country, the public will associate EncircleALL with high quality services at great value. Make life easy for your callers by promoting the universally recognized and preferred dialing method “00” for operator services. Your callers will love how easy it is to access an operator and you’ll love the increase in commissions you receive. Add 40 million new customers by catering to the 40 million people that make up the Hispanic population of the United States. All English directions are extensively translated into Spanish for the broadest possible appeal. No coins? No problem! In addition to collect calls, callers can make calls and pay for them on both major credit cards and non-proprietary calling cards. With TTM, the callers’ payment options are increased and so are your commissions! The Handset and Globe equal World-Wide Recognition! EncircleAll visual prompting, "Pick it up and make a call!" Clearly displayed on all EncircleAll advertising signage...sending the message again and again! Add commissions by enabling operator assisted international calling. One of the easiest ways to increase revenue is to offer operator assisted International calls through TTM. There’s absolutely no risk and every call billed means higher commissions to you and positive customer experiences. Convert dial around calls into calls that pay you a healthy commission by appealing to people that make collect calls and having them dial through your service rather than through another carrier. Increase OSP calls by attracting AT&T calling card holders and prompting them to call using “00” rather than 1.800.CALLATT. You now get commission for the call rather than waiting months for dial around compensation. The EncircleALL INFO Card completes the EncircleALL advertising signage and contains dialing instructions and regulatory information. It is customizable, in that it provides you with the ability to edit local and domestic long distance coin rates and durations, Refund/Repair Number, Your company name and even your company logo are easily incorporated into the INFO Card via a powerful web interface. Up-to-the-date carrier contact information is provided for each TTM EncircleALL Provider. Public Warnings can help keep most people honest. With EncircleALL you can feel confident that your INFO Card will contain front-line warning to help protect your payphone and investment. Convenience window provides you with the ability to add location specific information such as payphone address and/or ANI where required. Add your company logo to your INFO Card. By including your company logo along with your contact information, you build your identity, image and brand recognition on every payphone in your route. Regulatory requirements differ from State-to-State. With EncircleALL you can rest assured that your INFO Card will contain the correct information for the State where the payphone is located. As regulations change, TTM will keep you up to date and in compliance. Prominent local coin information, including the duration will stress the value to cell phone callers. EncircleALL local coin rate can be modified to reflect the rates and durations of your choice. Just tell us the local rate and the duration and we’ll do the rest. Visually promoting your NATIONWIDE long distance at a GREAT rate will resonate value. Watch the coins add up! EncircleALL makes it easy for you to choose a rate plan that works for you, offers great value to your callers and drives out some of the competition from prepaid cards. Service desk, refund & repair number can be modified to suit your chosen access method. Simply tell us how you want people to access your refund & repair service and we’ll print the INFO Cards accordingly. Easy to follow, step-by-step instructions walk the caller through operator service, directory assistance, emergency, repair/refund and other miscellaneous calls.